This is one of those cards that I couldn't get to look quite right last week. Originally, I was using Jen del Muro's Sketch For You To Try from last week. Jen's sketch from this week (on the left) seemed to bring this card together for me. The tree from Season of Friendship is embossed with White Embossing Powder. 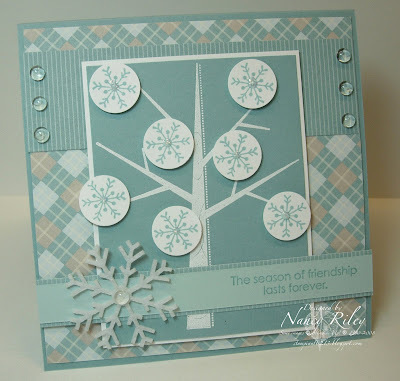 The snowflakes are stamped in Baja Breeze, punched out with the 3/4" Circle Punch, popped up on Stampin' Dimensionals, and Diamond Stickles (non-SU) were added to the centers. The designer paper is called Manchester from the current catalog and idea book. oooh, love that. So pretty!! Well, you sure got it to look right now! It's gorgeous!! ACCCKKK!!! This is AWESOME GIRL!! I never would have used that DP on a winter card, but it WORKS!! WOW!!!!! You always amaze me! Gorgeous Nancy!!! Love the softness, the popped up snowflakes and the added dew drops~!! Beautiufl! love the punched snowflakes! Don't you hate when you struggle with a card? This turned out wonderful in spite of that. TFS. Oh I just love your colours and the punched snowflakes! Beautiful job with Jen's sketch WOW! This is just beautiful Nancy!!! I haven't tried a winter tree with this set yet...you've really inspired me. Love the papers and all the details...perfect! Gorgeous, gorgeous, gorgeous!! I totally love this set because you can use it all year 'round! I hope it makes it into the big catty! Thanks for sharing!! Ok you have officially talked me into this set.....now to see if it makes the big catty.....This is my most favorite card using this set. You get the BEST SEASON OF FRIENDHIP CARD award!